We are pleased to announce a new feature: the Read the Paper button. 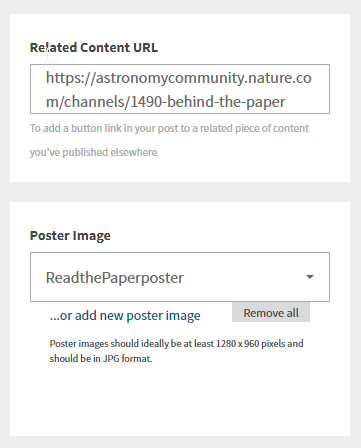 This button means it is now even easier to link Behind the Paper posts to their associated publication. You can find 'Read the Paper' button at the top right corner of a post, in line with 'Like', 'Comment' buttons and next to the 'Share' button. Clicking on it will take you to the publication referenced in the Behind the Paper post. Have a look now! This Read the Paper button will now automatically appear at the top of your post so that anyone reading it can easily link to the paper. Have a go yourself on your next Behind the Paper post!